Many examples of ankle sprain occur when a rapid shifting movement is made with the foot planted, such as when you play soccer or get tackled in football. Often the ankle rolls outward and the foot turns inward. 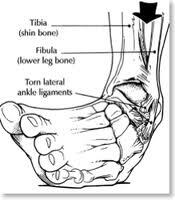 This causes the ligaments on the outside of the ankle to stretch and tear. Less often, the ankle rolls inward and the foot turns outward. This damages the ligaments on the inside of the ankle. Traumatic ankle injury with negative radiological findings. Graded I-III with Grade I being ligamentous trauma without laxity, mild pain and swelling. Grade II being ligamentous trauma, considerable signs of swelling, pain, loss of motion. Grade III being ligamentous laxity and joint instability. Elastic wrap or gel cast for compression. “Weight bearing as tolerated” with crutches if antalgic gait present. Do not prescribe posterior splint or recommend non-weight bearing as these result in increased swelling, pain and risk of Reflex Sympathetic Dystrophy/Complex Regional Pain Syndrome. Ice and elevation for 20 min every 2 hours for 72 hours or as long as swelling is present. Appropriate restrictions of activity with profiling. Return to full activities is expected for Grade I sprains in 3-4 weeks and for Grade II sprains in 6-8 weeks. The time to return to full activities for Grade III varies and is dependent on orthopedic management choice. Patient will require a period of functional rehabilitation between the return of normal strength and motion and return to normal activity. This is normally determined by Physical Therapy. Physical Therapy: Routine referral for rehabilitation of recurrent Grade I and all Grade II sprains, and/or if the ankle is tender to palpation. Orthopedic Surgery referral for all Grade III sprains and any grade if plain radiographs are suggestive of any pathology. An ankle sprain is a very common injury. Approximately 25,000 people experience it each day. A sprained ankle can happen to athletes and non-athletes, children and adults.